I was banging on yesterday about some of the new shades in Macedon wine. Here’s exhibit A.
Lyons Will is the label of Oliver Rapson and Renata Morello, whom are a prime example of what happens when wine takes over your life. 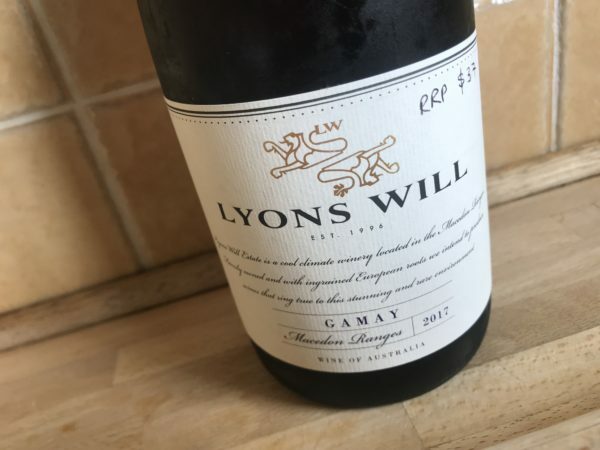 They’ve poured all their hours into setting up the Lyons Will label while still maintaining jobs on the side (and a young family). Plus they’re helping to run the Macedon Ranges Vignerons Society, just because there aren’t enough hours taken up. As someone with a chronic over commitment (to everything) problem, I dip my lid. This Gamay is the first for Lyons Will, and I really like it. The Gamay is cropping at just 0.9t acre for this initial harvest, so no volume and very early days. But delicious. There’s blueberry and cherry fruit, the light and finely spicy palate that has all the purple Hubba Bubba berry exuberance of Beaujolais Nouveau, but with an extra tier of flavour. There’s a hint of undergrowth and a general brightness, a wine of freshness and vitality. I opened it and stuck it back in the fridge, and with a light chill this worked even better. Enjoyable, fun drinking light red. Best drinking: Now. 17/20, 90/100. 12%, $37. Would I buy it? I’d share a bottle, drink most of it, though it’s not cheap – especially with cru Beaujolais not necessarily more expensive.